No, I'm not trying to pull your leg - this is regular passenger traffic. 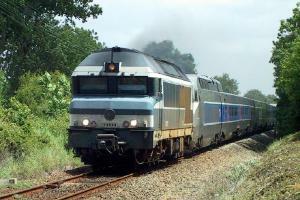 The TGV Vendée has a fast run on a dedicated highspeed line from Paris to Le Mans. To Nantes, it continues on an electrified line of the traditional network. In Nantes, a class 72000 diesel loco is attached, which brings the TGV to Les Sables d'Olonne. The type 72000 locos were built 1967-1974. For this traffic, refit with Scharfenberg couplers was necessary. It is planned to electrify this line until 2005 or 2006.